Drohobytsch, February 21/28, 1856 - Krakew, July 17, 1879) was a Jewish painter, of Polish-speaking Galician Jews from the western part of Ukraine. He was born in Drohobych (at that time Austria-Hungary), Galicia, modern Lviv region, western Ukraine. Maurycy was one of Isaac and Fanya Tigerman Gottlieb's eleven children. At fifteen, he was enrolled at the Vienna Fine Arts Academy. Later, he would study under Jan Matejko in Krakew. However, he experienced anti-semitism from his fellow students, and left Matejko's studio after less than a year, he then traveled to Norway settling in Molde. After several years he returned to Vienna to pursue his Jewish roots. 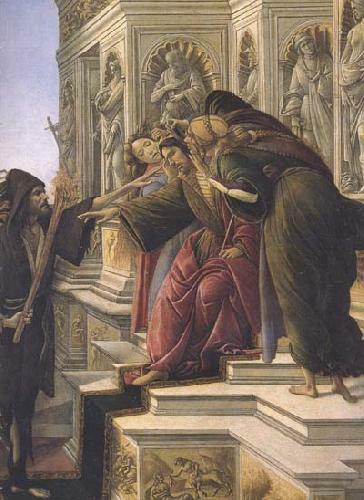 At twenty, he won a gold medal from a Munich art competition for Shylock and Jessica (at right), showing a scene from Shakespeare's The Merchant of Venice. He based Jessica's face on that of Laura Rosenfeld, to whom he had proposed marriage. However, Rosenfeld rejected his proposal, and wed a Berlin banker. Gottlieb then planned to marry Lola Rosengarten, but when he heard about Rosenfeld's marriage he committed suicide by exposure to the elements, dying of complications from a cold. Despite his early death, more than three hundred of his works survive, though not all are finished. After the fall of the Iron Curtain, many Polish collections unknown in the West were discovered, and his reputation grew greatly. His brother, painter Leopold Gottlieb, was born five years after his death.